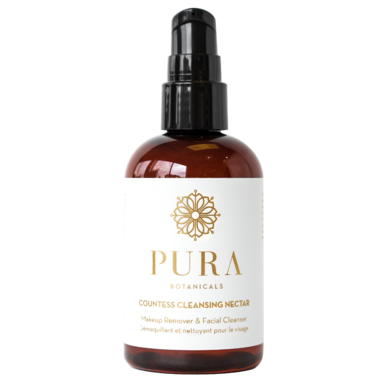 The Pura Botanicals Countess Cleansing Nectar is a gentle, lightweight, hydrating cleanser inspired by the Italian Princess, the Countess of Nerola. It is handcrafted with neroli, French lavender, frankincense, sweet orange and calendula. This combination of biocompatible oils, vitamins, and nutrients promotes luscious, radiant skin, fades sunspots and scars, diminishes fine lines and tones and tightens the skin, without stripping the skin’s natural moisture barrier. High in essential fatty acids and Omega-3, this non-greasy formula is ideal for normal to dry skin types. It leaves the skin feeling clean, supple and nourished. Wild harvested, sustainable, fair-trade ingredients. Handcrafted in small batches in Edmonton, Alberta, Canada. Gluten-free and cruelty-free. No synthetics, GMOs, parabens, phthalates, sulphates, mineral oils, preservatives, or artificial ingredients. The Ritual: Shake gently before use. Use daily by massaging into the skin and neck with gentle circular motions. Rinse with fresh water and pat dry. I like the way this makes my face feel. I mainly bought it to remove my makeup, as it is advertised to do, however, it does not remove my eye makeup. Okay, I was super excited when I purchased this product that this would be my Holy grail face wash. It was a bit irritating for my sensitive skin. My skin would feel tight afterwards too. Sorry, this is going into my reject pile. Excellent..this is my second order and I'm very pleased with the products..I have sensitive and now maturing skin and they work wonderfully..I love the fragrances of the products..soft, gently and sweet..
My go-to cleanser! Love the entire line. Quality ingredients and works well with my sensitive skin. I only use a couple of pumps with my face brush or hands and it leaves my skin feeling silky and smooth. Smells divine! I've been getting lots of compliments on my skin after using Pura Botanical products!